Situated on the suburbs of megacity Karachi, the project is on the Super Highway, almost at a distance of 56 km from the main city. The project directed by DHA Karachi is an under-developing mega housing society that stretches for over 20,000 acres of land. The project has been designed to accommodate over 1 million population of the city. DHA City aims to tackle the constantly increasing challenges related to housing in Karachi. In this regard, they’ve designed a sustainable strategy for the circulation of power and water, waste management, and transportation. At the entrance of DHA City, there is a beautifully designed entry point which has now become an identity for the city. The central entry point of the project is situated at a distance of around 2 km from M-9, the Karachi-Hyderabad Motorway. The main route which will connect DHA City to the eastern side of Karachi will be the Malir Motorway. This motorway will be constructed with the approval of City District Government Karachi (CDGK) and Sindh Government. 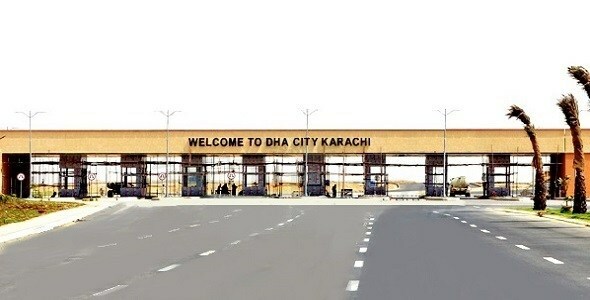 DHA is expected to be developed in the riverside of Malir River, giving strategic connections to Super Highway, and opening the new prospect for business and other economic practices in the vicinity. The construction of Malir Motorway will allow commuters to cover an hour-long journey from DHA to DCK within 20 minutes. Therefore, the construction of this motorway is one of the major attractions that draw investors’ interest in the project. The development of the project kicked off back in 2012. Since then the construction is going in full swings. DHA City is basically classified into a multi-unit housing zone, ‘culture and art sub-district’, mixed-use sub-district, a sports hub, university complexes, healthcare city, mall zones, and business district. There are essentially 16 sectors. A well-planned network for transportation has been designed to assist residents with their commuting needs. Basically, there are a couple of roads that pass through DCK, linking to M-9 Motorway as well. As we’ve mentioned earlier about the Malir Motorway. The design of residential areas in DCK ensures that the residents have easy and quick access to everyday necessities. The transportation map in DHA City comprises of various road networks along with intersections, roundabouts, and service roads. The project’s enormous plan also contains modern buses, trams, number of pedestrian bridges and spacious parking lots. Moreover, the Karachi Bus Rapid Transit System (BRT) has been extended to DCK. Additionally, the area will also enjoy the Blue-line of the KBRT system, which will allow a connection to the main city. To link the northern and southern side of society, the construction of DHA City interchange is also underway. Keeping the comfort and convenience of residents in mind, the developers have designed a number of stores and supermarkets in society. These shops will be situated near to the residential areas so that the residents will not have to travel or drive at a distance for their everyday needs. According to the map of the project, for each community of 250 families, an area of around 400-yard has been reserved for the marketplace. Talking about the surroundings of the project, there are a couple of supermarkets such as Ideal supermarket and SHaheen superstore located in Gulshan-e-Hadeed, situated at an almost 50-minute drive from DHA City. The administration of DHA City has planned to build a grand mosque in DHA City. It can accommodate over 1000 worshippers at a time. The mosque will have all the necessary features such as cold storage room, effective ventilation system, mortuary, area for ablution, and toilets. All the major areas of the building will have skylights installed. The design of the mosque is based on the inspiration taken by traditional Islamic architecture. Apart from this central mosque, DCK will have dedicated mosques for each sector and sub-sector. DHA City has a dedicated district to cater to the educational needs of society. The district named as “Knowledge Park” is something about which DCK claimed, will be “an epitome of your enlightenment.” DHA City envisions to provide top-class education facilities for its residents. In Sector 3, there is an operational kindergarten and a primary school. Moreover, many well-known schools of Karachi will also open their campuses in the DCK. The City School will inaugurate its campuses in Sector 3. will also open its branches in Sector 3 of this society. 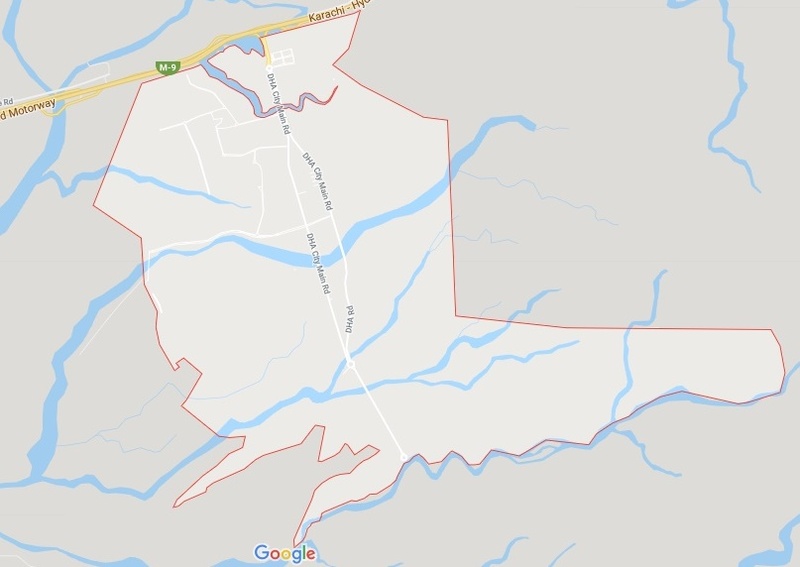 According to a rough estimation, over 60 schools are expected to be constructed in this vicinity. DHA’s reputable brand Suffa University and DHA College will also have their campuses in DCK. Additionally, DCK has also signed an MoU with Dow University of Health Sciences and Institute of Business Administration Karachi (IBA). An MoU has also been signed between DCK and Institute of Business Administration and Dow University of Health Sciences. To attract the interest of major banks of the country, DCK is recently offering auction bids for commercial plots in Sector 3. A few commercial plots of 300 sq. yd are being offered at comparatively lower rates than the market prices to attract potential commercial banks. DHA City, Karachi is calling auction bids for commercial plots in Sector 3. DHA City already has an operational Dubai Islamic Bank and as development will proceed by the passage of time, we will see more banks in DCK with their fully functional branches. DHA city has established a 300-watt conventional energy plant to provide its residents with a flawless supply of electricity. Moreover, DCK also initiated a solar energy park stretched out to over 64 acres of land to meet the ever-growing energy challenges. There is also an under construction wind energy park. The Solar Project will have the integrated smart grid technology which allows the system to generate the electricity main utilizing the copious sunshine. DCK is basically utilizing these solar panels for dual objectives by placing them in a tree-like position. One objective is to extract maximum sunlight, while the other one is to provide a shaded area for parked vehicles. In the beginning, DCK has established a pilot project of 1.1 MW to provide electricity in the project. In the later stages, DCK has enhanced the capacity of the solar project to 1.5MW by adding modules in the system. This process has been completed successfully, connected and has also effectively begun supplying electric power to various buildings in the society. DHA City has a dedicated district for health facilitation of its residents. The healthcare district is stretched out to 105 acres of land. A number of reputable national and international hospitals will establish their branches in the DCK’s healthcare district. Moreover, DCK will also build its own 1000-bed hospital. The internationally recognized Shaukat Khanum Memorial Hospital and Research Center will also be established in DCK. Shaukat Khanum will be spread out to over 20 acres of land. This iconic hospital will have operating rooms, an ICU, chemotherapy facilities, nine clinical departments, and a large oncology center to facilitate cancer treatment. In Sector 3, Dow University Hospital has already started its operations. Farmhouses in DCK are available in different sizes from 2000 to 2500 sq yd. The construction of these units is fully in compliance with the international standards, consisting of 3-4 bedrooms with attached washroom, a garage and a servant’s quarter. Keeping the security-related challenges in mind, these farmhouses will be protected by a three-tier security system, which will comprise of security staff, CCTV cameras, and guarded boundaries. To ensure the standard of living, round-the-clock maintenance services are also available. DHA City has a dedicated district for commercial activities within the project. In the commercial district, a wide range of facilities will be given to assist businesses to grow. DCK basketball court having a day and night facility for players. The sports arena, having lawn tennis, courts for basketball and futsal and an outdoor gymnasium. Other than theme parks, DCK will also have Lake View Parks, a zoo and bird park. DHA City is situated at a distance of almost 38 minutes from Bahria Town Karachi. Therefore the residents of DHA City can enjoy all the amenities offered by Bahria such as Danzoo wild-life safari park, theme parks, restaurants, and many more. DCK envisions to give a luxurious yet comfortable lifestyle to its residents by offering the highest quality of living. In spite of the fact that it is situated on the outskirts of the city, the residents will have all the basic facilities available to them. In any case, the residents living in DCK, similar to those living in other areas of Karachi, could endure water shortage. Due to tube-wells working in adjacent zones, the underground water level has gone down. DCK has mulled over this and has constructed five check dams to gather water. This will, ideally, fathom any water shortage related issues, making DCK a promising housing venture for many homebuyers.